The first bona-fide engineer was a military chieftain, and the first engine was a battering ram. This was in the beginning of historic times. In after ages when the properties of steam were discovered the two (the engine and steam) developed into the steam engine. But, the first "engine," so called, was a single beam of heavy wood; next in order, several such were attached to each other, end to end, until a total length of 100 or 150 feet was attained, and borne, in the attack, upon the shoulders of scores of fighting men. Step three in the progress towards the modern engine, was to plate the end of the awkward, effective beam with iron; fourth, to swing it forward and backward suspended from a tall frame work, which in time grew into a tower manned by soldiers. Next appeared a machine called a catapult, used to cast rocks and other projectiles, and in course of time still other devices were invented to assist or repel attacks upon towers of defense and enclosed towns. These warlike contrivances were the first engines, and were so named, and the men who invented and constructed them were called engineers. The term comes from a word in the Latin language—ingenium—signifying ingenious The word has been transferred to the French, German and Italian languages, as well as the English, but always retaining its original meaning. Upon the advent of gunpowder, and the introduction of artillery, those who operated the guns continued to be called engineers, and for a long time received four times the pay of a common soldier. Giovanni Branca, of Lorreto, Italy, in the year 1629, produced a machine combining an engine and boiler, the power from which was derived from the expansion of water into steam. Branca, in his writings, claimed that much useful labor could be accomplished through his device. 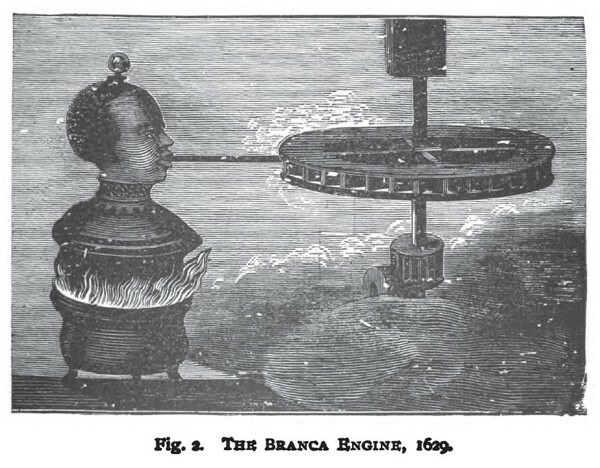 There were other inventors in the field in the early part of the same century in which Branca lived, but the machines and contrivances to utilize the energy known to be locked up in steam, never (like the one illustrated, Fig. 2), amounted to much more than idle dreams. Fig. 3 illustrates the Newcomen engine, which was patented in 1705. Our space is too limited to go irto a detailed statement of its method of action, except we may say that the steam was let into the cylinder (C) a little above atmospheric pressure, and by its elastic force raised the piston, and the stroke was completed by the condensation of the steam which produced a vacuum and allowed nearly the full pressure of the air to accomplish the desired result of raising the water. Note.—One of the Newcomen engines was erected in Holland to aid in draining a lake near Rotterdam. The following were the extraordinary dimensions: Cylinder 52 inches in diameter; stroke 9 feet. The boiler was 18 feet in diameter, and contained 2 flues; but 60 years later engines with 12 feet diameter of cylinder and i0 feet stroke were erected in Holland to do similar work. It was the Newcomen form of engine that Watt and Trevethick found in general use when they began their improvements. Between 1765-74, John Smeaton devised a succession of improvements in the atmospheric engine, and carried it to its utmost perfection; in these days it was still named the fire engine. The force was exerted in but one direction, and could not exceed the atmospheric pressure, in fact, was even short of this, for the vacuum was far from being complete. 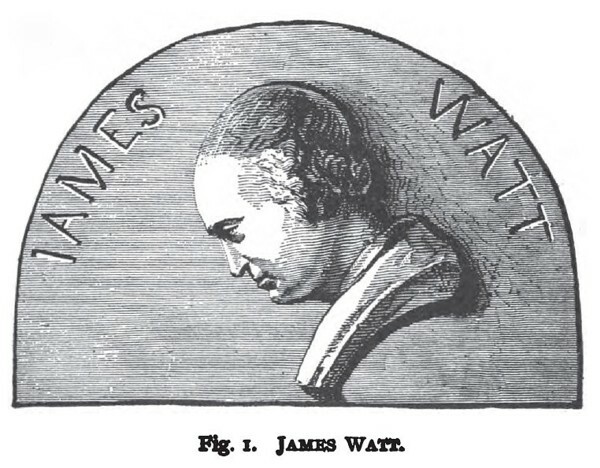 The improvements of the engine on scientific principles commenced with the days of Watt. Fig.1 is a very rare imprint of the immortal designer and inventor of the modern steam engine and its invaluable adjunct, the Indicator. Fig. 4 represents Watt's Condensing Engine. James Watt was born at Greenock, Scotland, January 19th, 1736. His grandfather, Thomas Watt, was a school master, and his father a prominent citizen of Greenock, being a merchant and builder. At the age of eighteen, James went to Glasgow to learn the trade of a mathematical instrument maker, and opened a small shop, by which he earned a scanty living. The introduction of the Newcomen engine into the neighborhood, led him to study the history of the steam engine, and to conduct for himself researches into the properties of steam. In his experiments he used, at first, apothecaries' phials, and hollow canes for steam reservoirs and pipes, and later a Papin's digester and a common syringe. The latter combination made a non-condensing engine, in which he used steam at a pressure of fifteen pounds to the square inch. This experiment led to no practical result, and he finally took hold of a Newcomen model which he obtained from London, and putting it in repair, commenced experiments with that, and made with it considerable progress. 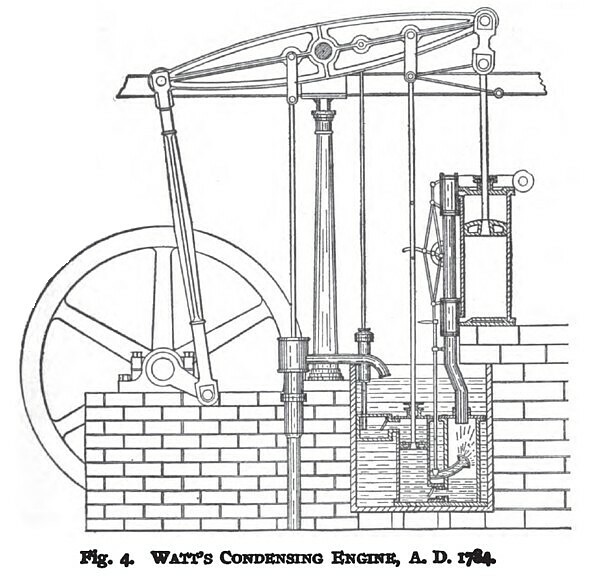 Watt next made a new boiler for experimental purposes, and arranged it in such a manner that he could measure the quantity of water and of steam used at every stroke of the engine. After establishing the elements of the new science, i. e., the bulk of steam as compared to water, the quantity of water evaporated per pound of coal, the quantity of water required for condensation, etc., etc., his next important invention was the separate condenser, and when this latter achievement was accomplished, his life's work was virtually done. Note.—This was early in 1765, when Watt was twenty-nine years of age. He soon after formed a co-partnership with Matthew Boulton, and his career thereafter was that of a successful business man, whose inventions were nearly all of immediate practical value to the firm and to the world. Watt died August 19th, 18i9, in his 84th year, rich and more honored than many kings. His statue stands in Westminster Abbey, London, amidst those of the noblest of Englishmen, who by their heroic deeds, have become the glory of their country. Note.—By the year 1784, Messrs. Boulton & Watt had brought their engine to a position where it combined all the devices which Watt had either improved from old models or clearly invented himself. There were a pair of their engines erected in London, in this year of sufficient power to drive twenty pairs of millstones. In these engines were to be found the newly applied fly-wheel, the glass water-gauge, the mercury steam gauges, "fly ball" governor, the poppet valve with beveled seat, the cross head and guides, and many minor improvements covered by Watt's numerous patents.